Thanks to cbabb Design for the amazing icon art! 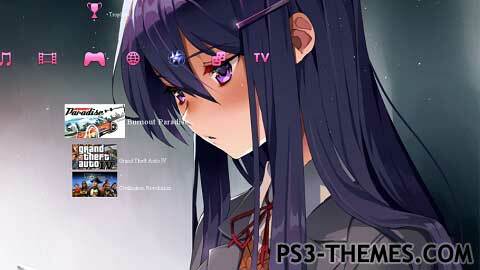 This is a simple, fan-made theme based off of the narrative-driven game, Doki Doki Literature Club, featuring Yuri. This theme is the updated 2.0 version of the theme titled “Doki Doki Literature Club (Monika)”. This theme was posted by PS3 Themes on March 13, 2018 at 5:56 pm, and is filed under Gaming. Can u make one with the Saiory’s suicide? Hey, sorry for not replying! What other themes would you want? Would you want a different background? love it can u make more? ?